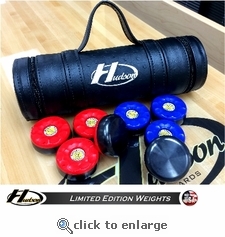 These Limited Edition Shuffleboard Weights are designed to be the smoothest on the market. Each weight is hand polished for consistency then finished in a black coating. Each set includes 4 red and 4 blue weights with removable caps. Also available is our new carrying case that features a divider in the center to conveniently separate your red and blue weights. Current lead time is 2-3 weeks once order is placed.